Wonder Woman has got such a cool story-line going on right now. Olympus is such a mess with the First Born ruling over it all. It's hardly recognizable. 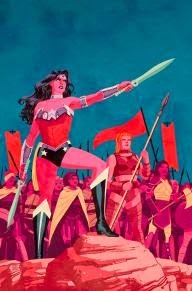 On top of those troubles, Wonder Woman has the added struggle to reconcile with her fellow amazons now that they've been released from the spell that held them as snakes. Since the amazons knew that they had been turned into snakes and back again, they must have been able to hold onto their own minds. They didn't simply become animals. Not only did they hold onto some sense of self but I feel like they had some sense of time. They are very tetchy after they had been released from the spell that was binding them and that seems like something that can be attributed to the situation they were put in and how long it took for them to be released. Unfortunately, Diana's mother is still a statue. Hera should have been able to transform her to her normal self but it's almost as if there is another force in play that is holding her back. There could be the possibility that Hera is lying to Diana, too, about her ability to transform Hippolyta. There's the issue that Hippolyta slept with Zeus so Hera could still hold a grudge about that. But there's nothing suspicious or malicious about the way Hera is acting. Wonder Woman has a full plate on her. With Hippolyta still a statue, Diana (who is princess of the amazons) is now queen. She needs to be able to control and govern the amazons but Diana likes to do things her own way, just as she had taken on the mantle of War in her own way. She can't really rule the amazons in a typical fashion either because they are suspicious of her and her role in Hippolyta's current state. So Diana turns to the amazons as a sister and a ruler for she orders them to look after Zola's child as her first act. A crazy, good scene is the snippet we see with Hel speaking to Zeus. I can't remember if we ever saw Zeus before in this series. Zeus looks sad and feeble. He's like an empty shell of a god. This issue ends with this scene and it's such a good cliffhanger because not only is Hel and Zeus there but the First Born has come to snuff out Hel's little candle head. I love the way these story-lines keep evolving. Each character is interesting. I, also, like how not one of the gods are simply good or bad. They work for and against each other depending on their personal motives at any particular time. The only really evil character right now is the First Born. He's had a lot of trauma and drama in his life though that has turned him into this monster. He literally has the scars all over his body to show for it. I loved the artwork, too. It's consistent, clear, and just fun to look at. That's a gorgeous cover by Cliff Chiang. I like how strong Wonder Woman looks.